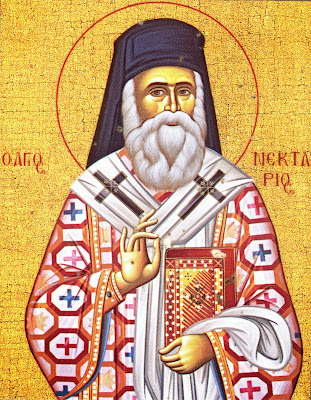 In the book, "Taxideuontas sta teixe tes poles" ("Traveling the walls of the city"), Nun Porphyria mentions a wondrous appearance and a great miracle of [Saint] Porphyrios, which shows that life continues after death, and teaches us that we should never loose hope, for God is All-Good and All-Powerful. It was 2PM, and I was in the Square "Agion Anargyron" of Athens. I was stopped at a light facing Athens. A man approached me..."Can you take me to Menidi?" "No," I replied, "I can't." I couldn't because at 3PM I had to take the taxi towards Pireus. The man stood in front of me, and was waiting for another taxi to pass by. Something within me said that I should help him. I made a sign for him to come over. As soon as he entered the taxi, he exclaimed: "It's impossible!" 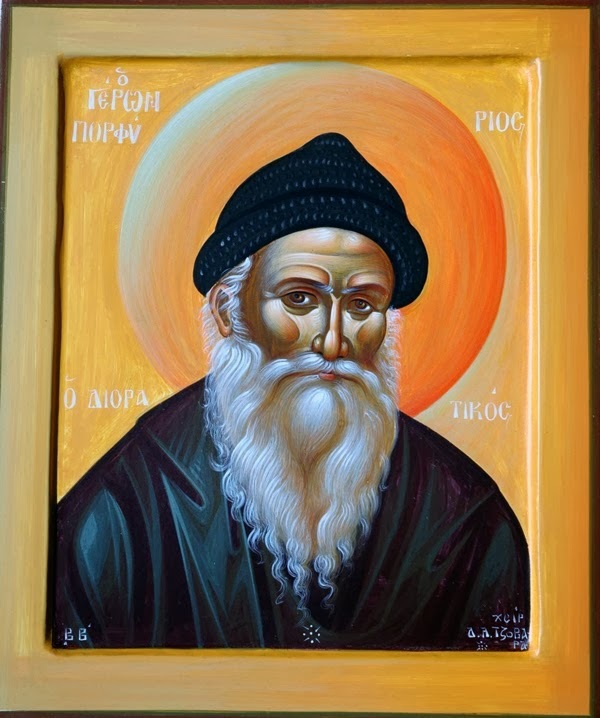 And he took the photograph of Elder Porphyrios [that I had in the taxi] in his hands, and kissed it. At that instant, the light changed, and I turned to head towards Menidi. I wanted to take back the photograph, but when I saw how much he looked at it with longing, I regretted my thought. "Do you know him?" He asked me. "No, but from his books I got to know him and love him very much." "Do you want, my lady, to hear how I got to know him?" "Of course" I replied with joy. "I heard that my wife was gravely sick, with cancer. The doctors gave her three months to live. During that time, my oldest son was finishing high school. And he told us that he had arranged to go with ten of his fellow students to Mount Athos for a week. We said it was alright; the children left. "In the meantime, my wife took a turn for the worse. The doctor that was following her told us that the end was near. We asked him in anguish: 'Doctor, what can we do to give her a little more life?' He replied: 'We can do a surgery, and may God help!' he replied. I agreed, and my wife consented, because she wanted to remain until our son returned. "My son returned so happy, so joyous, like we had never seen him before. He told us how beautiful it was there, and how warmly the monks received them, and how much peace he sensed within his soul. He said that he sensed the presence of God so much that he had forgot that his mother was sick. She was reminded, when Elder Porphyrios appeared before him. He told us some wondrous things about Elder Porphyrios, which appeared unbelievable to us." "Excuse me," I interjected, "When did this occur?" "'You know her?' he asked. "'Who are you?' they asked. "'I am Elder Porphyrios' he said, and he left. "During their return from the Holy Mountain they stopped in Ouranoupolis at a drug store to buy aspirin, for they were seasick and nauseous. Entering the pharmacy, they saw a photograph of Elder Porphyrios and said: "There is the Elder Porphyrios we saw on the Holy Mountain!" As soon as the pharmacist saw this, he was confused. "And my wife and I believed that they saw someone else, who looked like him and called himself Porphyrios. Because all monks resemble each other. "In reality, the tests were run. The next day the results came back, and the doctor took on a grave appearance. "'What did the tests show?' we asked him. It was as if the sickness had never touched her! The doctors looked at the old tests and the new ones, and were going crazy! It's impossible, and they said they would have to order new ones the next day, they said in surprise. "The doctors had given my wife three months to live. Two years have passed since then, and she is much better than she was before her sickness. Because of this, I love Elder Porphyrios very much. We have been to the Monastery many times. And whenever we have difficulties, he strengthens us." This man's story of another miracle of our Elder, gave me great joy. The only thing that I whispered as the man departed was: "Thank you." Note: The following is a translation from the Greek text, and the meter of this translation is not set to match the original music. And intercedes, that we be granted theosis. O shepherd of the Father's sheep. O venerable one, to imitate his life. Rejoice, O source of healing for the passions. Rejoice, the godly mystic of the ineffable. Rejoice, organ equaling a divine river of grace. Rejoice, for you guide athletes in their struggles. Rejoice, you who taught us the things of salvation. Rejoice, you through whom we are delivered from pain. And shared their way of life. As a reward for your holy life. Rejoice, the lover of the holy life. Rejoice, equal to the athletes of Christ. Rejoice, most-holy mouth that studies mysteries. Rejoice, the beauty of those who struggle on Athos. Rejoice, you who speaks to us the truth. Rejoice, O spring of healings of the soul. And crushed him through your humility. You hastened towards your fatherland. Rejoice, the fruit of much piety. Rejoice, you who dissolved strands of confusion. Rejoice, O earthly angel, for whom heaven rejoices. Rejoice, for you grant joy and hope. Rejoice, fellow-partaker of joy and sorrow. Rejoice, our joy and health. As an angel dwelling in Babylon. Rejoice, you through whom the enemy is made fearful. Rejoice, the radiant diadem of Evia. Rejoice, for you were made worthy to see behold mysteries. Rejoice, , you who walked the path of sorrows. Rejoice, for you made the simple wise with divine knowledge. Rejoice, through whom many return to Christ. Through your divine prayers, O all-blessed one. 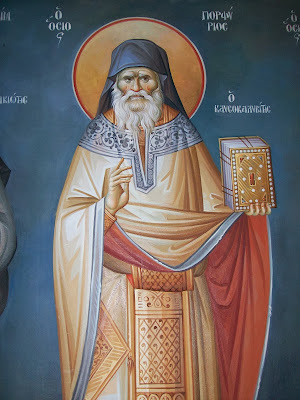 To St. Gerasimos, thus remaining humble, O venerable one. Rejoice, you who sowed love among the faithful. Rejoice, the spotless canon of piety. Rejoice, deeply flowing river of compassion and love. Rejoice, he who prays for those in pain and dangers. Rejoice, radiant substenance of the faithful. Rejoice, he who adorned many with piety. Joys and ideas of the world. Rejoice, you who tasted of the heavenly light. Rejoice, most-strict keeper of the commandments. Rejoice, you who were fulled with mystical theoria. Rejoice, for you were shown a partaker of dispassion. Rejoice, you who greatly loved Christ. Rejoice, you who entreats the Pure Virgin. As you beheld terrible and unspeakable mysteries. Rejoice, the interpreter of the words of Christ. Rejoice, the firm foundation of truth. Rejoice, the refuge and harbor for all who sail. Rejoice, you who studies the mysteries with discernment. Rejoice, you who endured a good transformation. Rejoice, stole rich in boldness. Of the joyous desert of Athos. And you never left her in spirit. Rejoice, you who grants these to us. Rejoice, the boast of those who live in the world in asceticism. Rejoice, soaring golden eagle of the clairvoyant nous. Rejoice, for you curtailed the homage of the faithless. Rejoice, you through whom those who stumbled are cleared. Rejoice, the true witness of Christ. 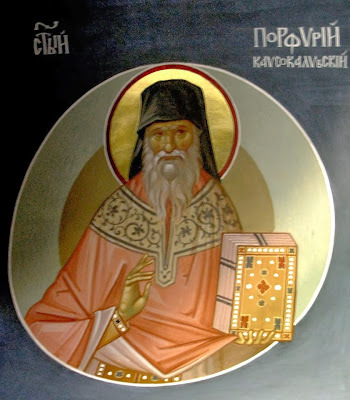 The Revelation on Patmos, as St. John the Theologian. You were shown a god-bearer to the world. Rejoice, you who grants us healings. Rejoice, you who flies through the air unseen. Rejoice, you who received very many graces from the Comforter. Rejoice, for you endured the pains of the ailing. Rejoice, dawn illuminating the darkness. Rejoice, you who resurrected many towards Christ. Granting us peace, O Father. And breathe forth hymns to God, O venerable one. And you laid down your life for them. Rejoice, you who struggled for His faith. Rejoice, you who fulfill every request of the faithful. Rejoice, the deliver of all from the battles of Belial. Rejoice, you who were nourished by the teachings of the Lord. Rejoice, you who were granted much gladness. Rejoice, you through whom faithlessness is shaken. We offer to your compassion. Astonishing the faithful who beheld you. Rejoice, true father, and Christ-bearer. Rejoice, irrefutable voice of truth. Rejoice, for you drive away the attacks of the demons. Rejoice, for you desired hesychia from your soul. Rejoice, for you were an ascetic and humble pastor. Rejoice, you brought joy to troubled souls. Rejoice, you who stand beside many in dangers. To truly reveal springs of water from the depths of the earth. And we hymn the All-Holy Trinity. Rejoice, the most-faithful life in purity. Rejoice, the unshakable foundation of piety. Rejoice, the ever-flowing river of truth. Rejoice, star most-radiant of the spiritual Heaven. Rejoice, you who trample on the arrows of the enemy. Rejoice, the angel of joy and hope. Rejoice, you who takes up our souls to the Heavens. And straightway the Kontakion again. 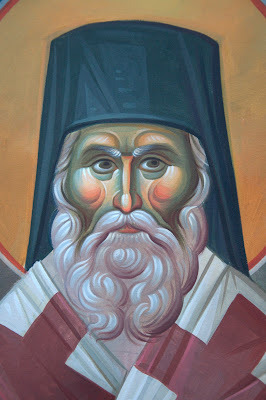 For the life of St. Porphyrios, see: http://full-of-grace-and-truth.blogspot.com/2012/12/the-life-of-elder-porphyrios-of.html. 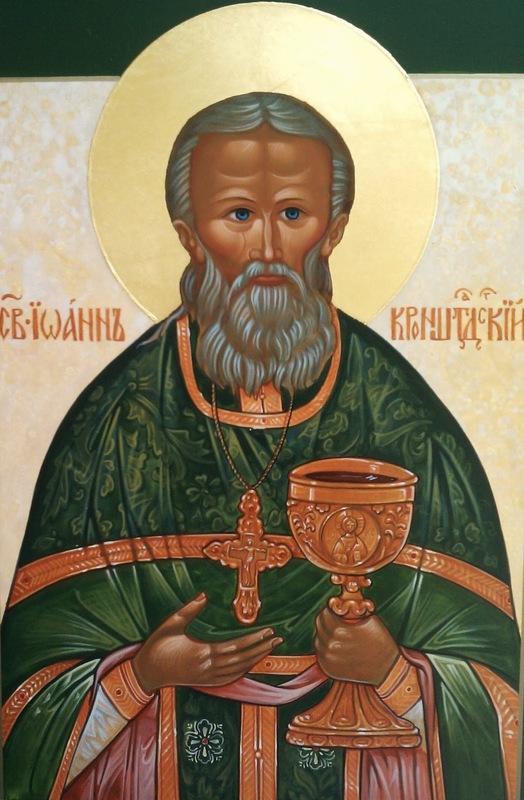 Hopefully there will be more provided about this great Saint of our days in the near future. May he intercede for us all and help us! Elder Porphyrios: "You should experience the mystery of the divine incarnation..."
Say this also yourselves. Say it again even more beautifully. I don't get my fill of this! This was announced from ages beforehand. What does the Katavasia of Christmas say? You should experience the mystery of the divine incarnation. 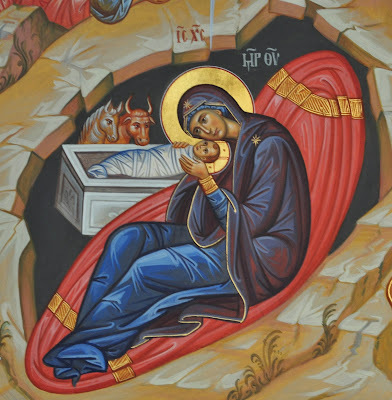 “Your Nativity, O Christ our God...” I say this within myself and cry. The Holy Spirit has crafted these, the “Today is the beginning of our salvation”, and the “Your Nativity, O Christ our God...”, they were not crafted by men. They are very rich in meaning and depth. Very strong words. You understand little. I am telling you the truth, it was not written by men, but by the Holy Spirit. I cry every time I hear them. As many times as I think of this, I am always moved. My Christ, my little Christ! Say it again, but with beautiful recitation. Read now, I can't speak, I can't, I am unable, I don't have the strength, I surrender, I should get up and hurry myself along. I am very moved, and my eyes filled with tears. And because I am laid up in bed, the tears don't fall down, but my eyes are filled with tears. All day, if you would tell me the troparion, I would be moved constantely. I should have two megaphones to stand upon the pine trees and to play “Today is the beginning of our salvation...”, and “Your Nativity, O Christ our God...” to be taken by the air and projected north and south, to be heard far away, so that all creation and nature would hear it! Rejoice at every opportunity of showing kindness to your neighbour as a true Christian who strives to store up as many good works as possible, especially the treasures of love. Our soul, as a spiritual, active being, cannot remain idle; it either does good or evil, one of the two; either wheat grows in it or tares. But as every good comes from God, and as the means of obtaining every good from God is prayer, those who pray fervently, sincerely, from the depths of their hearts, obtain from the Lord grace to do good, and, before all, the grace of faith; whilst, those who do not pray, naturally remain without these spiritual gifts, voluntarily depriving themselves of them by their own negligence and spiritual coldness; and as the wheat of good thoughts, inclinations, intentions, and works grows in the hearts of those who labour and pray fervently to the Lord, so in the hearts of those who do not pray, the tares of every evil grow, smothering the small amount of good that has remained in them from the grace of baptism, chrism, and subsequent penitence and communion. Therefore, we must most carefully look after the field of our heart, lest the tares of evil, slothfulness, luxuriousness, self-indulgence, unbelief, avarice, envy, hatred, and others, should grow within it; we must daily weed the field of our heart — at least, at morning and evening prayers, and refresh it by salutary sighs, as by healthful winds, and water it with abundant tears, as by early and late rain. Besides this, we must by every means implant in the field of our heart the seeds of the virtues, faith, hope in God, and love for God and our neighbour, fertilise it by prayer, patience, good works, and not for a single hour remain in complete idleness and inactivity, for in times of idleness and inactivity the enemy zealously sows his tares. "While men slept, the enemy came and sowed tares among the wheat and went his way." We must also remember that it is impossible to do good works without efforts. Since our voluntary falling into sin the kingdom of God cannot be taken otherwise than by "violence, and the violent take it by force." Why is it that only the narrow way and narrow gate lead to life? Who makes the way of the chosen narrow? The world oppresses the chosen, the devil oppresses them, the flesh oppresses them; it is these that make our way to the kingdom of heaven narrow. There is no need to ask anyone whether we ought to spread or propagate the Glory of God, either by writing, or by word, or by good works. This we are obliged to do according to our power and possibility. We must make use of our talents. If you think much about such a simple matter, then, perhaps, the Devil may suggest to you such foolishness as that you need only be inwardly active. O, if we turned our attention to the consequences of our sins or of our good works! How careful we should then be to shun sin, and how zealous in all that is good! For we should then clearly see that every sin not eradicated in time becomes strengthened by habit, becomes deeply rooted in a man's heart, and sometimes troubles, torments, and wounds him until death, becoming, so to say, awakened and revived in him upon every occasion, reminding him of the sin formerly committed, and thus defiling his thoughts, feelings, and conscience. Streams of tears are necessary to wash away the inveterate filthiness of sin. How tenacious and malignant it is! Whilst, on the contrary, every good action done at any time sincerely, disinterestedly, or having become a habit by repetition, rejoices our hearts and forms the joy and comfort of our life by the consciousness that we have not spent our life entirely in vain, full of sins though it is; that we are like men and not beasts; that we, too, are created after the image of God, and that there is a spark of the Divine light and love in us; that, although they are but few, our good works will form a counterpoise for our evil ones in the balance of God's incorruptible righteousness. How and when are we to care for the imperishable raiment of the soul: meekness, righteousness, chastity, patience, mercy, when all our cares, attention, and means are directed to perishable raiment and the adornment of our body? We cannot serve two masters: for the soul is simple and single. How and when are we to care for the spiritual riches of good works, when we are only greedy after perishable riches and strive to amass it with all our might and means, when our heart clings to money, to the world, and not to God? 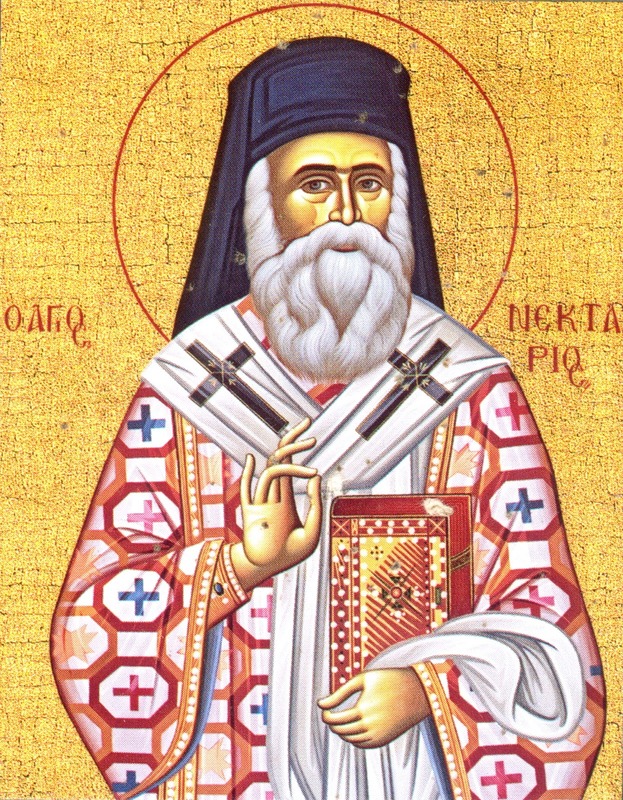 How and when are we to care for the incorruptible spiritual food and for the blessed drink — for prayer, the reading of God's word, the writings and lives of the Holy Fathers, the Communion of the Body and Blood of the Lord, when we hardly let food and drink out of our mouths, and this stupefying lit-up poisonous smoke which many consider so pleasant? How can our soul rejoice in the Holy Spirit, when we are continually occupied by earthly, vain pastimes and pleasures? O, ruinous service to corruption, drawing us away from the life incorruptible, true and eternal! ... Therefore the Holy Spirit is absolutely necessary to us all in all our good works. He is our power, strength, light, peace, and comfort. ... continually force yourself to be kind when others exasperate and offend you, to pray for your enemies, for meekness, humility, gentleness, truer benevolence, generosity, disinterestedness, abstinence, chastity, alms-giving, truth and righteousness, industry, obedience, and others. It is difficult to conquer the passions, which become as though our natural members ("Mortify therefore your members which are upon the earth"), but by being continually watchful over yourself, by constant fervent prayer and abstinence, with the help of God you will be able to conquer and eradicate them. We must never forget that we are all one body, and that we should stimulate each other to love and good works; we pastors should especially remember and do this... This is why the Lord said: "Let your light so shine before men that they may see your good works, and glorify your Father Which is in heaven." "If, therefore, the light that is in thee be darkness, how great is that darkness!" Concerning modern works of charity. If you enjoy earthly blessings in full measure, and if you give to the needy, but indulge yourself still more, it means that you do good works without the least self-denial. Your works of charity are not great. But what else do we find? What are so-called works of charity? People arrange different entertainments with a charitable object — that is, they intentionally wish before all to serve their sinful flesh, the Devil, and only afterwards their neighbour and God. But this is no charity at all! Such works only bear the name of charity. "Let us do evil, that good may come." "Woe unto you that are full, for ye shall hunger! Woe unto you that laugh now, for ye shall mourn and weep!" Why, after every six days, is a day of rest observed? In order that we may continually remember that after the labours of this present life, the day of eternal rest will come; for in accordance with the apostle, "there remaineth therefore a rest to the people of God." And Sunday betokens the day of the general resurrection, after which a day of rest shall come for all those who have done good work in this present life, in Christ Jesus. You cannot conquer any passion, any sin without gracious help; therefore, always ask the help of Christ, your Saviour. It was for this that He came into the world, for this that He suffered, died, and rose from the dead, in order to help us in everything, to save us from sin, and from the violence of the passions, to cleanse us from our sins, to bestow upon us power in Holy Spirit to do good works, to enlighten us, to strengthen us, to give us peace. You ask how you can save yourself when sin stands at every step, and you sin at every moment? There is a simple answer to this: at every step, at every moment, call upon the Saviour, remember the Saviour, and you will save yourself and others. I am morally nothing without the Lord. I have really not one true thought or good feeling, and can do no good works; without Him I cannot drive away from me any sinful thought, any passionate feeling such as malice, envy, fornication, pride, and so forth. The Lord is the accomplishment of everything good that I think, feel, and do. O, how boundlessly wide is the Lord's grace acting in me! The Lord is everything to me, and so clearly, so constantly. Mine — is only my sinfulness; mine — are only mine infirmities. O, how we ought to love our Lord, Who was pleased to call us into existence from non-existence, to honour us by His image and likeness, to establish us in a paradise of delights, to subdue all the earth unto us, and Who — when we did not keep His commandments, but were allured by the enticement of the Devil, and immeasurably offended our Creator by our ingratitude, and assimilated unto ourselves all the qualities of the tempter (pride, malice, envy, ingratitude) and all his evil arts, which he taught us as his prisoners — did not reject us for ever, but deigned to redeem us from sin, from the curse and death into which we had fallen through sin, and Himself appeared upon earth, having taken our nature upon Him; He Himself became my Teacher, my Healer, my Worker of miracles, my Saviour; He Himself bore the punishment for us, died for us in order that we should not be eternally lost. He rose from the dead, in order to raise us too after death. He ascended into heaven, in order that we, too, should ascend, we who had fallen so low through sin; and He became everything to us — food, drink, light, purification, sanctification, health — and the power that protects, saves, preserves, and has mercy upon us. Do you pay sufficient attention to the state of your soul? whether it is in good health, and, seeing that it lives, is its life vigorous? And, if its present temporal life is happy, then is its eternal life, its eternal happiness, ensured by anything — for instance, by faith — is there in your soul a lively faith in God, in the Saviour, in the Church, — by good works, meekness, humility, gentleness, love of truth and honesty, abstinence, chastity, mercy, patience, obedience, industry, and others? If the reverse is the case, then all your labour is in vain. The soul, perhaps, does many things worthy of wonder, but it will be itself lost. "For what is a man profited, if he shall gain the whole world, and lose his own soul?" How corrupt I am become through sin! Anything bad, evil, impure immediately enters into my thoughts and is felt in my heart, whilst anything good, right, pure, holy — is often only thought and spoken of, and not felt. Woe unto me! for as yet evil is nearer to my heart than good. Besides this, we are at once ready to do evil as soon as it is thought of or felt, and we do it quickly and easily if we have no fear of God, whilst "how to perform that which is good I find not" the power within me, and the intended good work is often put off indefinitely. Man! the Creator's omnipotence, wisdom, and mercy, which were poured out upon the visible and invisible world, are ready to be bestowed, in all their infinity, upon you also, if you endeavour to be a true child of the Heavenly Father, if you fulfil His commandments to love God and your neighbour. Give yourself up, then, untiringly, and with all your might, to good works and deeds. Do not only do your work when you wish to, but do it especially then, when you do not wish to. Understand that this applies to every ordinary worldly matter, as likewise, and especially, to the work of the salvation of your soul — to prayer, to reading God's word and other salutary books, to attending Divine service, to doing good works, whatever they may be, to preaching God's word. Do not obey the slothful, deceitful, and most sinful flesh; it is eternally ready to rest and lead us into everlasting destruction through temporal tranquillity and enjoyment. "In the sweat of thy face," it is said, " shalt thou eat bread." O miserable soul, "carefully cultivate the talent granted unto thee," sings the Church. "The kingdom of heaven suffereth violence, and the violent take it by force," says our Lord and Saviour. "Seek ye first the kingdom of God, and His righteousness; and all these things shall be added unto you." How are we to seek first the kingdom of God? In the following manner: let us suppose that you wish to walk, or drive, or else go in a boat somewhere on any worldly, temporal business; before doing so, first pray to the Lord that He may correct the ways of your heart, and then also your present bodily way, or that He may direct the way of your life in accordance with His commandments; desire this with all your heart, and often renew your prayer concerning this. The Lord, seeing your sincere desire and endeavour to walk in accordance with His commandments, will, by degrees, correct all your ways. The way to succeed in any good work. When you are praying at home, at evening, or at morning prayer, or in the church during Divine service, be solicitous in your heart to accomplish this particular good work, and heartily desire to fulfil it to the glory of God. The Lord and His Most-pure Mother will unfailingly teach you, will instil in your heart some bright idea how to accomplish it. In all your works, either at home or at the place of your service, do not forget that all your strength, your light and your success are in Christ and His Cross; therefore, do not fail to call upon the Lord before beginning any work, saying: Jesus, help me! Jesus, enlighten me! Thus your heart will be supported and warmed by lively faith and hope in Christ, for His is the power and glory unto ages of ages. If you have Christian love for your neighbour, then all heaven will love you; if you have union of spirit with your fellow-creatures, then you shall have union with God and all the dwellers of heaven; if you are merciful to your neighbour, then God and all the Angels and Saints will be merciful to you; if you pray for others, then all heaven will intercede for you. The Lord our God is holy, be so yourself also. When the foolish thought of counting up any of your good works enters into your head, immediately correct your fault and rather count up your sins, your continual and innumerable offences against the All-merciful and Righteous Master, and you will find that their number is as the sand of the sea, whilst your virtues in comparison with them are as nothing. Whilst the soul, changeable in its relation to God, suffers changes in itself, thus it unavoidably expands and obtains peace of heart when it draws nearer to God by faith and good works, and unavoidably contracts, becomes restless and wearied, when it withdraws itself from God by unlawful acts, want of faith, and unbelief in God's Truth. In trees there is organic earthly life; in the Christian race the life of Christ, heavenly, spiritual; and we must look upon the spiritual capabilities and powers of true Christians as upon the powers of Jesus Christ Himself. "We have the mind of Christ," said the Apostle of true Christians; we must also look upon good works as upon the fruits of the grace of Christ. It is a strange phenomenon in our nature, perverted by sin, to hate those to whom we do good, and to make them pay for our benefits by disliking them! Oh, how narrow and poor in love and grace is our heart! How selfish it is! The enemy may well mock at us; he wishes to destroy the fruits of our good works. But the more good you do to others, the more you must love them, knowing that those who receive your benefits serve as a pledge to you of your receiving forgiveness from God. "Worship God in spirit and in truth." In truth, for instance, when you say, "Hallowed be Thy Name." Do you really desire that God's name should be hallowed by the good works of others and by your own? "How can I prepare for death in a Christian manner?" 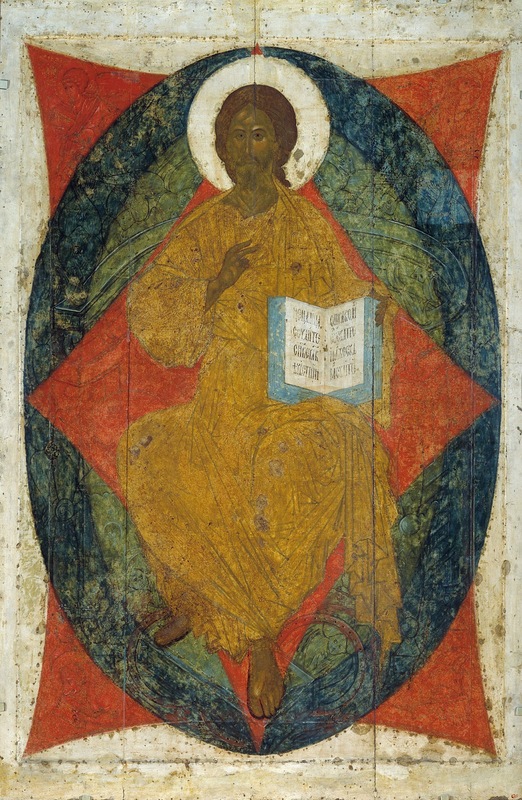 By means of faith, by means of good works, and by bravely bearing the miseries and sorrows that happen to you, so as to be able to meet death fearlessly, peacefully, and without shame, not as a rigorous law of nature, but as a fatherly call of the eternal, heavenly, holy, and blessed Father unto the everlasting Kingdom. Deny yourself sensual delights in the hope that, instead of them, you will obtain higher spiritual, heavenly delights. Do good to all in the hope that, in accordance with God's justice, "with what measure ye mete, it shall be measured to you again"; that the good you have done to your neighbour shall be sooner or later returned into your bosom, just as the evil you have done him shall sooner or later be returned into your bosom. Remember that we are one body. "We being many are one bread." Remember that God is just to the highest degree, to an iota. When the Devil is in our heart, then we feel an unusual, overwhelming load and fire in the breast and in the heart. The soul contracts extremely and darkens, everything irritates it, it feels an aversion to every good work; the words and acts of other persons in reference to ourselves we interpret falsely and see in them ill-will and designs against our honour, and therefore we feel a deep, deadly hatred towards them; we are infuriated and long for vengeance. "By their fruits ye shall know them." There are days when the spirit of evil disturbs me. Both the spiritual and bodily powers of a man increase and become perfected and strengthened by their exercise. By exercising your hand in writing, sewing or knitting, you will accustom it to such work; by frequently exercising yourself in composition you will learn to write easily and well; by exercising yourself in doing good works or in conquering your passions and temptations, you will in time learn to do good works easily and with delight; and with the help of God's all-active grace you will easily learn to conquer your passions. But if you cease writing, sewing, knitting, or if you only do so seldom, you will write, sew, and knit badly. If you do not exercise yourself in composition, or do so very seldom, if you live in the material cares of life only, it will probably become difficult for you to connect a few words together, especially upon spiritual subjects: the work set you will seem to you like an Egyptian labour, if you cease praying, or pray seldom; prayer will be oppressive to you. If you do not fight against your passions, or only do so seldom and feebly, you will find it very difficult to fight against them, you will often be conquered by them; they will give you no rest, and your life will be poisoned by them, if you do not learn how to conquer these evil, inward enemies, that settle in your heart. Therefore labour and activity are indispensable for all. Life without activity is not life, but something monstrous — a sort of phantom of life. This is why it is the duty of every man to fight continually and persistently against the slothfulness of the flesh. God preserve every Christian from indulging it! "They that are Christ's have crucified the flesh with the affections and lusts." "Unto everyone that hath shall be given, and he shall have abundance; but from him that hath not, shall be taken away even that which he hath." With the words in your heart "All things are possible to him that believeth," strive after everything good and praiseworthy. Whatever good work you have the intention of doing, always have faith. Preserve by every means simplicity of heart, simplicity of faith, hope and love, of meekness, humility and gentleness. Every good comes from God, and God is every good for us. This is the simplicity of faith, hope, and love. Be bold, resolute in every good work, be especially generous in words of kindness, tenderness, sympathy, and still more so in works of compassion and mutual help. Consider despondency, despair in any good work, as an illusion. Say: "I can do all things through Christ Which strengtheneth me," though indeed I am the greatest of sinners. " All things are possible to him that believeth." "Christ came upon earth in order to raise us up to heaven"; that it is not right to attach ourselves to anything earthly; and that we must value time in order to win eternity; to cleanse our hearts from every impurity, and to do as many good works as possible: "My meat is to do the will of Him That sent Me, and to finish His work." "He that gathereth not with Me scattereth." It is necessary to advance in the spiritual life, and ascend higher and higher; to increase more and more the stores of our good works. If we remain stationary at one point of moral perfection, upon one step of the Christian ascent, it is equal to our going back; if we do not gather, it is equal to scattering. Condakiou at Matins on Holy Tuesday. If it is the Lord's will that we be granted physical healing of our illnesses, this often is brought about, in an awesome manner, through the prayers of Christ's Saints. But more importantly. the Saints, show us how to live a true life in Christ, so that, when it is time for the journey of this temporary life to come to an end, we might be shown the way to the Kingdom. The following moving event reminds me that "whether we live or die, we are the Lord's". I write these lines with great emotion, faith and hope. It was the past March (2012), when the results of my mother’s MRI showed cancer in her head, her lungs, her adrenal and likely in her bones...two months to live, that’s how much the doctor gave her. One summer night, St. Nektarios appeared to my in my sleep and told me: “I will sprinkle nectar in your life.” Up to that instant, I had never ever called upon him, and I knew nothing of his life or his miracles... He simply came to me in my sleep, bringing this joyous message. I was hooked by this. The next evening, I went for a walk with my husband and my children. In a neighborhood home there was a chapel in the yard, and we stopped to have a discussion. Mr. Photis had lost his son. 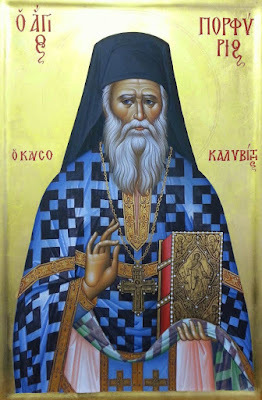 I told him about my dream, and he told me that he had the icon of St. Nektarios in his chapel. He showed it to me, and I realized that this was the same person who appeared to me in my dream. I cried with tears of faith, and he cried, and gave me the icon... I looked online, and found your site. I read the life of the Saint and his miracles...my faith increased... “There are others,” I began to think. I brought the icon and put it at the head of her bed. M.M. Elder, let us move onto a different topic. Speak to us on the relationship that you and every Athonite has with the Panagia. Elder Markellos: It is Her Garden, and we are her children. Once, an Athonite monk was sick. In order to be healed, he took refuge in the Panagia of Tinos. There, of course from reverence, he slept at night within the church. In reality, therefore, Panagia visited him, but in a...unique manner. She gave him a motherly slap, saying at the same time: "What do you want here?" He replied: "My Panagia, I came to find my health." "Well, why didn't you call me and entreat me in my Garden? I'm there every day along with you. Was there a need to come here?" Then the poor monk lost it, and awoke thinking: "Wow, what a fool I am, what am I doing here?" This motherly position Panagia has before all of us, and when we are pleasing before Her--according to Her promise--she gives us everything. The blessed Elder Ephraim of Katounakia said: "Are you being tempted? 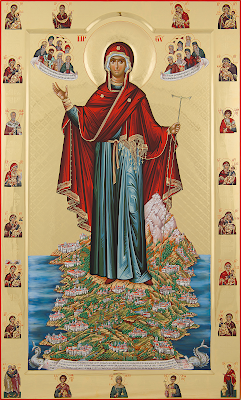 Grab hold of the Panagia by her dress and call upon Her! She is a mother, she will hear you." He said this with joy, and also with faith that it would thus occur. When he sought for something from the Panagia, She gave it to him. 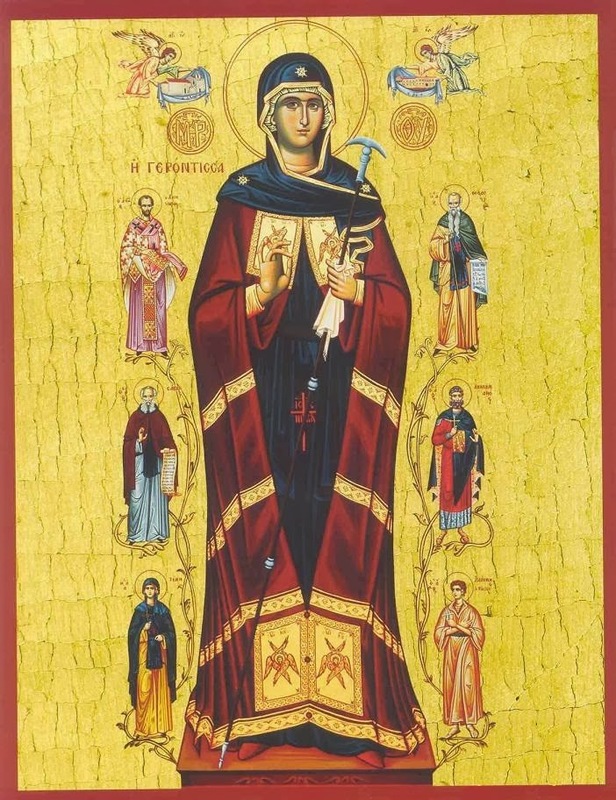 There is a story regarding an astonishing vision having to do with the Athonite Fathers and the Most-Holy Theotokos, which depicts her many times as an Abbess, as the Gerontissa of the Holy Mountain, with Her rod and mandya. She visits, she keeps vigil, she cares for Her children. An Elder saw this astonishing vision: "The Second Coming, the Last Judgment had come. The Panagia as an Abbess passed by the cemeteries of the Holy Monasteries, by the Sketes, by the Hermitages, where there were the graves of the Fathers. As she passed by the place of the Fathers' rest, she would hit Her staff on the graves, and the Fathers would rise!" 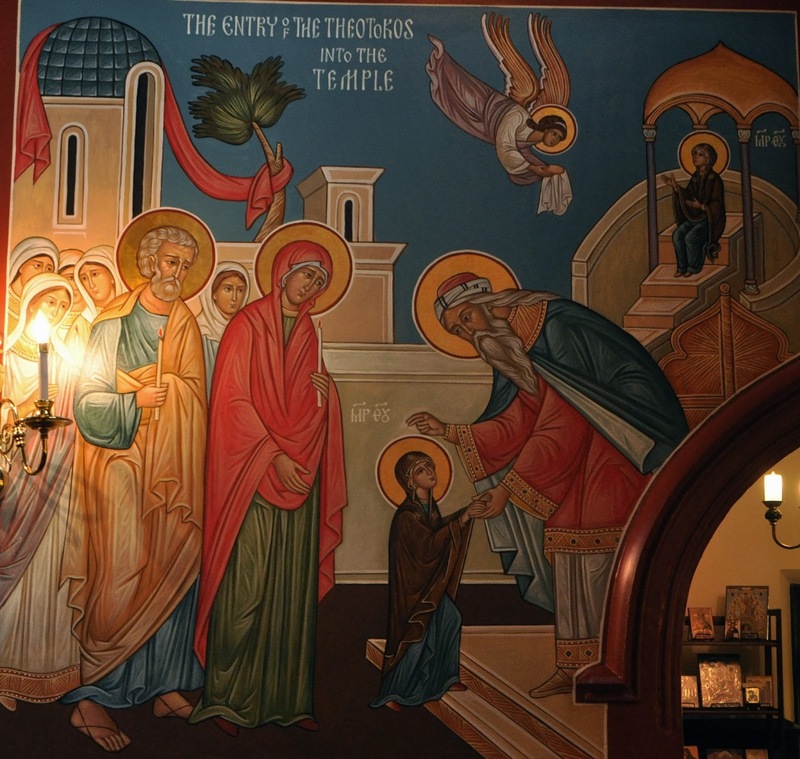 An astonishing vision... All the resurrected Fathers followed the Panagia, who went before them, and arranged them into a large flock, the flock of the Most-Holy Theotokos. 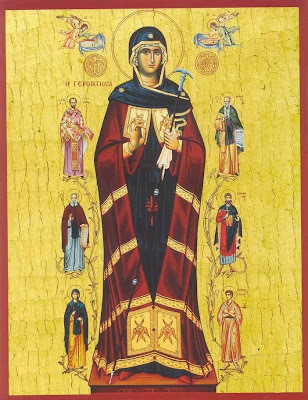 The Athonite Fathers were and are Her children, and she led them and leads them to the Kingdom of the Heavens. An incredible vision. But once in a while, from certain graves, the Panagia did not take the Fathers. She left them there. They were those monks who did not take care in their life, who did not keep their monastic promises and their monastic duties. These cried out, mourned, wailed, entreated: "Take me too, Panagia! Take me together with You!" 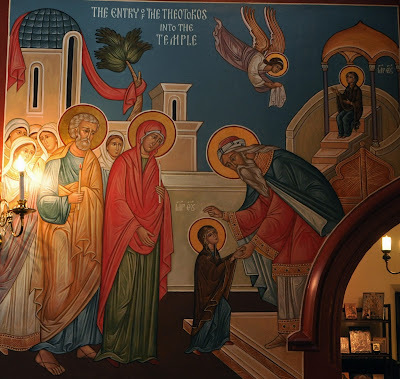 However, she did not take them, and they remained complaining and estranged from the great brotherhood, the Synodeia of the Most-Holy Theotokos. Every Athonite monk senses the Panagia as his Mother. Whatever he asks of Her with faith and purity, the Panagia brings about, but he must try to always be pleasing before Her in his life. In other words, he must try to not make his life something that would sadden his Mother. 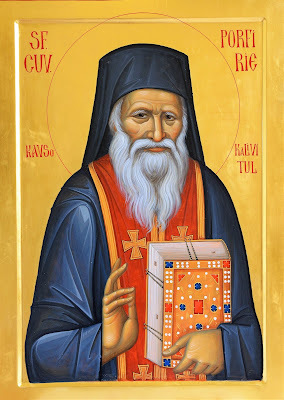 From Elder Markellos of Blessed Memory, Former Abbot of Karakallou Monastery, Mount Athos. From the Book: Logos Athonos, by Manolis Melinos.